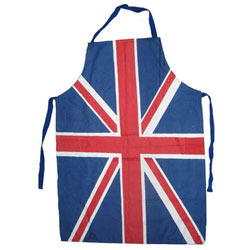 Our product range includes a wide range of cotton apron. Taking into account of our affluent knowledge and skills, we are valued in this domain as a leading manufacturer and exporter of Cotton Apron. These aprons are basically made for the kitchen purposes while cooking foods. These are made using finest quality cotton and latest machinery in our production facility. We can customize our Printed Cotton Apron by fitting them with pockets, buttons and zippers and also with attractive graphics. These are available at a very reasonable rate.